Once downloaded, you will have to extract the image, which is in compressed xz format. Once you have uncompressed the file you will have a .img file of about 5 GB. drwxr-xr-x   4 gvenzl staff 128B Mar 14 23:26 .
drwxr-xr-x+ 90 gvenzl staff 2.8K Mar 14 23:28 .. Put the SD card into your SD card reader. 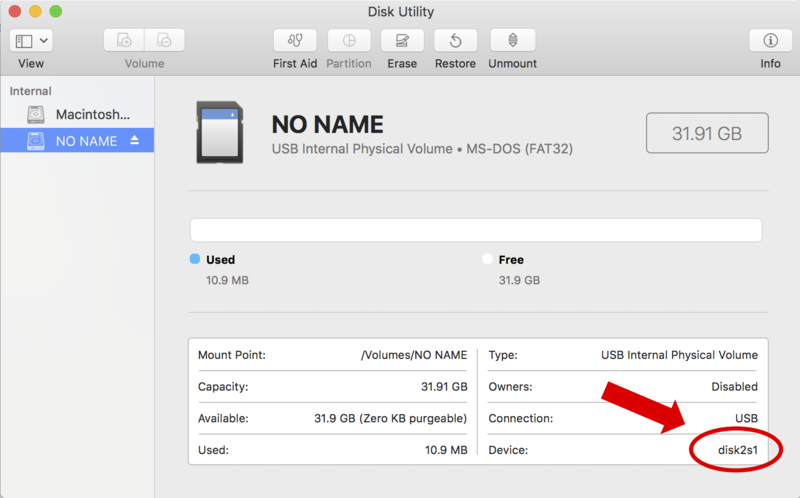 Open the Disk Utility tool, the SD card should be visible in there, and remember the device at the bottom right for the next step and close Disk Utility again. The device name of the device you just unmounted. Here is where it gets interesting: the device above already has a partition on it, which is FAT32. This is reflected by the s1 part in /dev/disk2s1. You can also see it in the Disk Utility as well. The Oracle Linux disk image is a complete one, not just for a partition. That means that you will have to image the entire disk, not just partition s1. To do so, just leave out s1 and image /dev/disk2 instead. In case that you just see something like /dev/disk2, it means that your SD card hasn’t been formatted yet and you can proceed the very same way, by imaging /dev/disk2. bs for the block size to use for a given write operation. In my case I used 16MB but don’t worry too much about it. In theory it can speed up your write operations but you will most likely anyway be limited by the 3-4MB/s that an SD card gives you. If the dd command finishes without any errors, your SD card has successfully being re-imaged. You can now take out the SD card from the SD card reader. The rest is business as usual. Put the SD card into your Raspberry Pi and boot it up by plugging in the power. Then log into the Raspberry Pi as the root user with the password oracle. You will have to change the password immediately after you login. You could also flash the SD card with Etcher. I use it all the time to flash Raspberry Pi images onto SD cards.